International media portray Helsinki in a favourable light and link the city to topics like design, food, sauna and architecture. These were the key findings from a publicity analysis M-Brain conducted based on editorial media coverage of the Finnish capital. 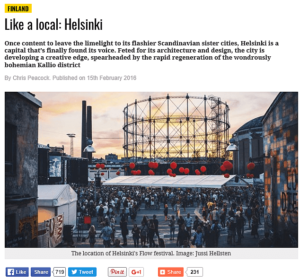 National Geographic Traveller found a soft spot for Kallio district. 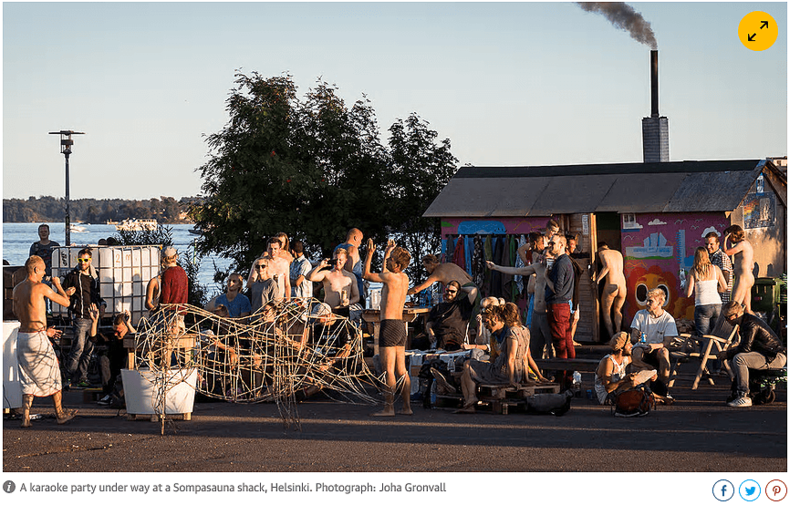 In 2016, the city of Helsinki came across in international media most commonly in connection with design & art, and almost as often with food culture. What differentiates Helsinki from other capital cities is the vast media interest in Finland’s, as well as the capital’s sauna culture. Sauna was the third most popular theme related to Helsinki in all international media and the most interesting theme to Spanish and UK journalists. The various saunas in Helsinki were covered at length, with some of the articles focusing solely on Helsinki’s sauna scene. Löyly, a vast design sauna complex located in Helsinki’s Hernesaari and completed in May 2016, was a great media success during its first year in action. 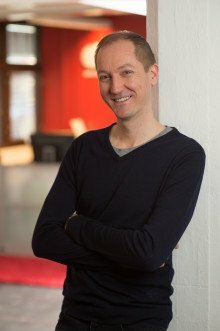 Out of all Visit Helsinki’s co-operation partners, Löyly received the largest number of mentions in international media. 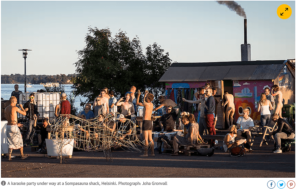 Helsinki Sauna Day, launched in March 2016, emerged as a new event to attract considerable media interest. Design and art were particularly interesting to Asian media. In Japan, China, South Korea and Hong Kong, the emphasis was on this topic, with several references to Marimekko, Iittala and Helsinki Design District. Meanwhile, Helsinki’s food culture interested across all regions, as did the city’s architecture. Other popular themes included the sea, city culture and urban nature. The media that wrote about Helsinki included publications such as The Financial Times, Lonely Planet, The Independent, USA Today, Huffington Post Travel, Oriental Daily News and hola.com. Helsinki’s visibility wasn’t restricted to editorial media only: for instance, The Guardian’s article titled “Finland’s sauna scene as hot as ever” was shared 1 929 times in Facebook. For some of the journalists who reported about Helsinki, the city was largely new territory, while others already had a preconception of the harbour side city. 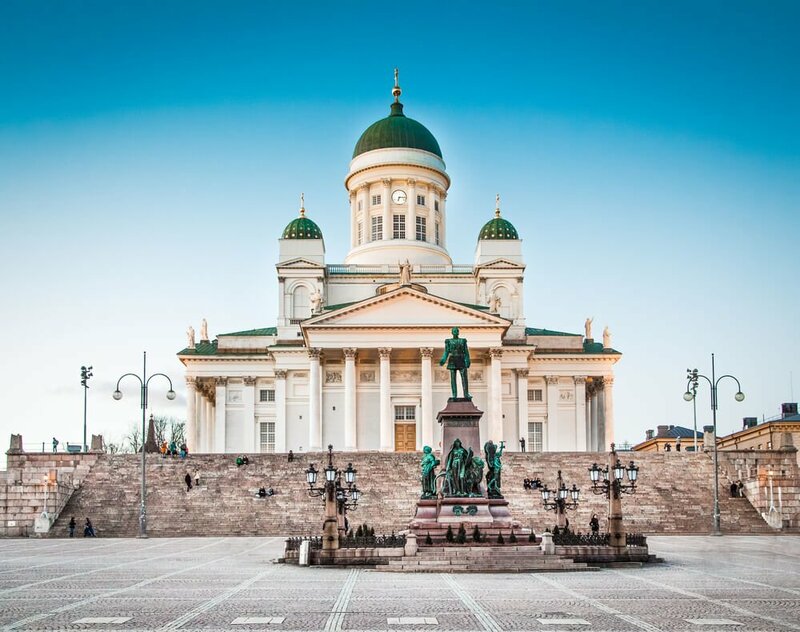 Helsinki was commonly compared to Swedish and Danish capitals and portrayed as a younger, less well-known sibling to these. 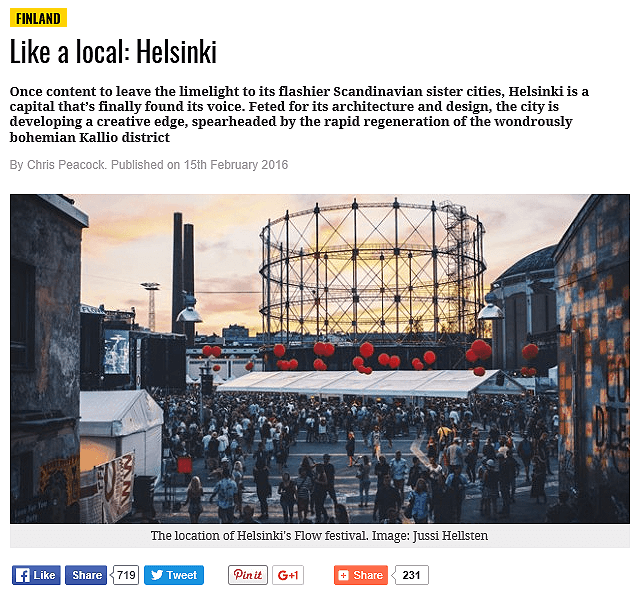 Helsinki as described in the US media, examples of which included USA Today, Huffington Post, Architectural Digest and Discovery Map Podcast. To Kerry Christiani from Lonely Planet, it is “amiable people, remarkably in tune with nature, who make Helsinki. This pocket-sized city will soon hook you with its unhurried attitude, lively food and design scenes and self-deprecating sense of humour”, Christiani concluded. In the analysis, we examined which textual and visual themes came up in connection with Helsinki, as well as which adjectives were being used to describe Helsinki. Differences between media of different countries were also analyzed. The media coverage surveyed was a result of Visit Helsinki’s PR work: foreign journalists travel to Helsinki as guests of Visit Helsinki and the organization’s co-operation partners. Afterwards, the visitors report about their experiences in the Finnish capital.